Is March The New May? Justice League: What Went Wrong? Fun and entertaining, just not all that smart, this one definitely makes you feel that it is a b movie the whole way through. Fast and the Furious 6 isn’t nearly as good as the fifth instalment was, and that’s mainly because it doesn’t have all that much new to offer. the plot of this team of car racing criminals being called in to work with the cops and be good guys is kind of neat, but other than that this is basic paint by the numbers stuff. some of the stunts are cool, others are kind of dopey. the good news is that the action runs throughout the movie without ever having too long of a gap in between. the dialogue is corny and the story is basically just one team against another, but for a b movie this one is entertaining and kind of fun. The Fast and the Furious Six is one of those middle ground entries into the franchise. It’s by no means the worst, but it’s also by no means the best. This one is just okay. It’s basically the average, standard of what one of these movies is like. That means it’s got a B movie feels, some ridiculous, but fun stunts, and a plot that is sometimes decent and sometimes pretty dumb. All of the stuff that furthers the character relationships and brings the gang back together with one of their former teammates is pretty cool, but most of the storyline about this new team that they are going up against is just ordinary and even kind of dull. The biggest problem is that the franchise is coming off of one of its best entries, fast five, and this sixth movie is definitely a step down. the fifth movie actually had a clever plot. it took place in rio, brazil, and was the oceans eleven of racing movies. that is to say it was a heist movie and not only featured the original cast members, but also brought in a new guy to the squad, the rock. now that means a lot to a number of people, but to me it doesn’t really mean all that much, simply because the rock is a guy who either makes bad b movies or jumps on board b movie franchises hoping to add a little something extra to them. that’s exactly what he did for the g.i. joe sequel, which didn’t amount to much. still in the fifth movie, the story was good and the action was fantastic. the movie was tremendously successful, and so the sixth film got the go ahead. but with this latest movie, it really seems like everyone just settled down and stopped trying as hard. the director, justin lin, is the guy who has made every fast and furious movie after and including tokyo drift. that means even before this latest one, he had two bad ones under his belt before finally turning out a good film for the fifth movie. sure, one could look at it like he was getting better and better with time, and maybe the sixth movie would be the best one yet, only lin got lazy and started thinking it was all too easy. he got the importance of interesting plot. it doesn’t really matter that the dialogue and characters are paper thin in the sixth movie. they never really were anything besides that, in any of the films. sure, dominic torreto has become more of a softie with each new film, to the point where in this latest movie all he talks about his family, but these movies were never about character. whatever rage torreto had in the films that came before this, is long gone. so is paul walker’s attempts at being a leading man. he seems to have given up by now, and is content to just be another player in the film, collecting a pay check for not doing much. the stories were never anything all that fantastic either. sure the fifth one had the best story in ages, but all it really did was give us an elaborate heist movie that brought in characters from all other movies. there was tyrese from the second movie and ludacris from who knows which film (i think he was the guy who started off one of the races, at the starting line, putting his hands down for the race to being, in one of the films.) the new sixth movie, thinks it is awfully clever because it is bringing back michelle rodriguez as letty, a character who supposedly died in the fourth film. and that is nice, to have her back, but it’s hardly enough to make this a good film. the plot is that there is a new band of criminals who pull off massive robberies and race around in cars. these guys seem unstoppable and the rock needs help bringing them down. that’s when he turns to torreto and his gang, who are in another country where there is no extradition. they all have criminal records and cant set foot in the states, but where they are now, the u.s. government can’t touch them either. the rock’s character, hobbs, gets dom’s attention when he takes out some photos of letty, showing that she’s still alive. What makes dom think these photos are recent and not from ten years ago? This is enough to get his attention, and bring his team together. but they want something more than just finding out about letty if they’re gonna help hobbs. they want their records wiped clean. the premise is fine. at least on the surface. things happen fast and it’s almost as if there are a lot of little stories in one, only most of these stories tend to be pretty stupid. take the little subplot of paul walker going to jail for 24 hours in order to get information from a guy serving time. the fact that he can get in and out, while being a wanted man himself, is ridiculous, even if he does have the help of an agent. and then we just get a fist fight and no real information coming his way as a result. the whole thing is a pointless waste. the action is the thing that keeps this movie going. good thing, because that’s really what someone comes to a movie like this for. 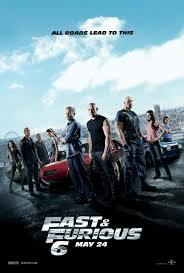 the movie opens with an action scene of dom and brian (walker) racing cars around the mountains. not long after that we are with shaw as he blasts through cars on the street at night with his armored vehicle that is designed to flip cars straight up into the air. from there we get a series of gunfights and fistfights. none of them is original or creative, and yet they do hold our attention. a major mistake that this movie makes with the action is to combine two fights and cut back and forth between them both. these are the fights between two of our heroes (tyrese and the asian guy), against a bad guy at the train station, and then letty and gina corano (so good in steven soderbergh’s haywire.) both fights would be pretty cool on their own, but mixed together, it actually takes away from each one of them. every time we leave a fight to go to another one, before cutting back, it takes us out of the scene. these fights should have been separated and each given their own time and attention. the fast and the furious 6 is not a bad movie, but it’s just not anything special either. these movies are all fun and entertaining, and i do appreciate that at least most of the stunts were done for real (unlike the fourth movie, which used crazy-fake looking computer effects.) the story here is one team against another. some of the action is fun, but none of it is really memorable. the biggest problem is just that the fifth movie was so good and set the bar pretty high. this next one doesn’t quite measure up.